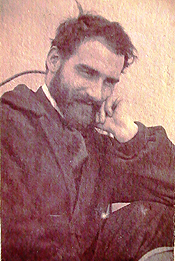 A native of Pocé, a village in northwestern France, Paul Alphonse Viry was born in 1832 and moved to Paris to study art sometime during the late 1840s. In about 1850, he was accepted into the prestigious Ecole des Beaux-Arts and began his studies under the guidance of François-Edouard Picot (1786-1868), a respected protégé of the neoclassical painter, Jacques-Louis David. Picot’s reputation as a teacher was well established by the middle of the nineteenth century, having received many large commissions for the government of the “citizen-king” Louis-Philippe during the July Monarchy of the 1830s and 40s. Viry must have arrived in Picot’s studio just as another pupil Alexandre Cabanel (1823-89) won the Prix de Rome in 1850, and as William Bougeureau (1825-1905), returned from his five-year stay at the Villa Medici in Rome. The neoclassical academic training Viry received in Picot’s studio served him well. Like all painters who studied at the Ecole des Beaux-Arts, Viry’s mastery of drawing and perspective was impeccable. However, the political upheaval following the revolution of 1848 created an unstable environment for initiating an academic career as a painter. The class struggles that caused the February 1848 uprising in Paris ultimately resulted in the creation of the Second Republic in December of the same year; and although the working people of France did not fare especially well under the reactionary leaders that took control, the artistic community was able to force the conservative juries of the Paris Salon to open the doors to a wider spectrum of styles. This gave support to the growing number of Realist artists such as Gustave Courbet and François Bonvin as well as the Barbizon painters of the 1830s who had been struggling for recognition for decades. The Salon of 1850-51, in particular, showcased a number of major Realist paintings that not only received critical attention, but also reminded the bourgeois Parisian public that revolution was still in the air. As a young artist during the short-lived Second Republic, Viry may well have been influenced by the new prominence of Realist genre painters like François Bonvin (1817-87) whose work drew inspiration from seventeenth century Dutch painting as well as the eighteenth century French still-life tradition of Jean-Baptiste-Siméon Chardin. In Viry’s work, this is most evident in his attention to the textures and colors of fabric, metals, fur, and various building materials. He made his Salon debut in 1861, some years after his studies at the Ecole must have been completed. The reason for this hiatus in the public record remains unknown. 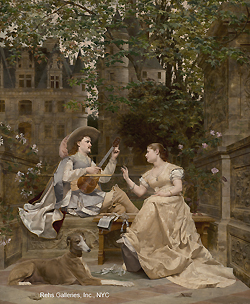 For the next twenty years, Viry exhibited regularly at the Salon, and developed a specialization in both troubadour genre paintings and domestic scenes featuring beautiful women in luxurious gowns. Two works from 1874 reveal the influence of both French Realism and perhaps the English Pre-Raphaelite Brotherhood; A Gallant utilizes a tonal color palette typical of Realism while Arranging Flowers is set in what appears to be an English gothic room. It might also be noted that many of Viry’s paintings include the depiction of hunting dogs, an element more characteristic of English nineteenth century painting than French. This may indicate that the artist spent a significant amount time either in England or catering to an English clientele. Viry’s interest in the American art market is more accurately documented. He exhibited a painting entitled The Doves at the Brooklyn Art Association in 1876, to positive critical notice. The reviewer in The Aldine notes that Viry’s painting “..is fanciful and prettily expressed. A tall, pale girl, dressed in rich dove-colored satin, is petting her dove in a large doorway, built of soft, gray stone, carefully molded. A greyhound stands by her side. There are no other colors to relieve this predominating delicate ash, but the rich green of two small vines set in a green boxes, a gorgeously colored pheasant at the sill, and the dull red and brown of a line of bricks that just appears above the portal. The effect is like that of frosted silver; and the design is a jeu d’esprit... The finish is simply wonderful.” [i] This description is consistent with Viry’s other tonal paintings from the 1870s, and was certainly well received by New York audiences of the time. The last decade of Viry’s life remains largely unknown, although it is probable that he died in 1913. [i] The Aldine, Vol. 8, No. 1 (1876): 27. [ii] The Collector and Art Critic, Vol. 2, No. 2 (Nov. 15, 1899): 28-29. [iii] The Art Amateur, vol. 1, no. 5, (October 1879).